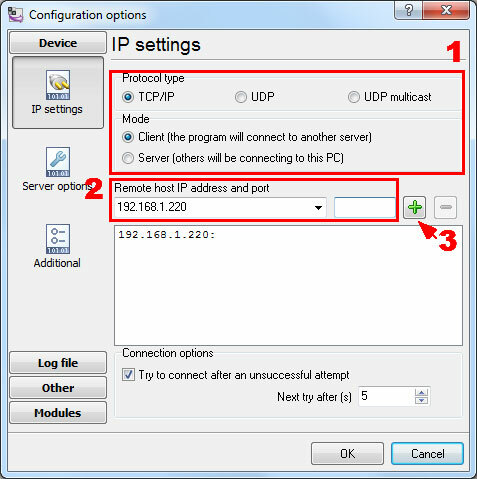 When using an IP connection from the CPU's ethernet port, set up the IP address used to connect from the PC to the Aspire system (Default: 172.16.0.10). Define the TCP port (0-65535) when communicating to the SMDR (type 5). If the SMDR connection is made using the COM port on the CPU, define the baud rate (0=4800, 1=9600, 2=19200, 3=38400). For each trunk, enter 1 if trunk's calls should appear on SMDR reportEnter 0 if trunk's calls should not appear on SMDR report. For each extension, enter 1 if extension's calls should appear on SMDR reportEnter 0 if extension's calls should not appear on SMDR report. 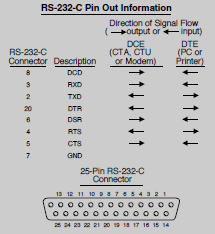 Select '0' if the dip switch settings are set to PC connection or select '1' if printer/SMDR connection is selected on the CTA/CTU adapter. Set the baud rate to be used by the CTA (0=4800, 1=9600, 2=19200). Specify the type of connection used for SMDR (0=No setting, 1=COM(NTCPU), 3=LAN, 4=CTA/CTU). The baud rate for the COM port should be set in Program 10-21-02 or 15-02-20. Specify the SMDR printer output port (CTA/CTU port number). Specify the language in which he SMDR header should be printed: 0=English. Enter the number of digits (1-24) you want SMDR to block (i.e., "X" out). Enter 0 not to block any digits. Enter the minimum number of digits a user must dial (1-24) before the system includes a call on the SMDR reportEnter 0 to include all outgoing calls, regardless of the number of digits dialed. Enter the minimum duration of a call (1-65535) that will print on the SMDR reportEnter 0 to have calls of any duration print. Enter how long an unanswered call must ring (1-65535) before SMDR logs it as "No Answer" Enter 0 to allow all "No Answer" calls to print. Enter 1 if you want the SMDR report to include calls blocked by Toll Restriction. Enter 0 to exclude blocked calls. If system is behind a PBX, enter 1 to have SMDR include all calls to the PBX. 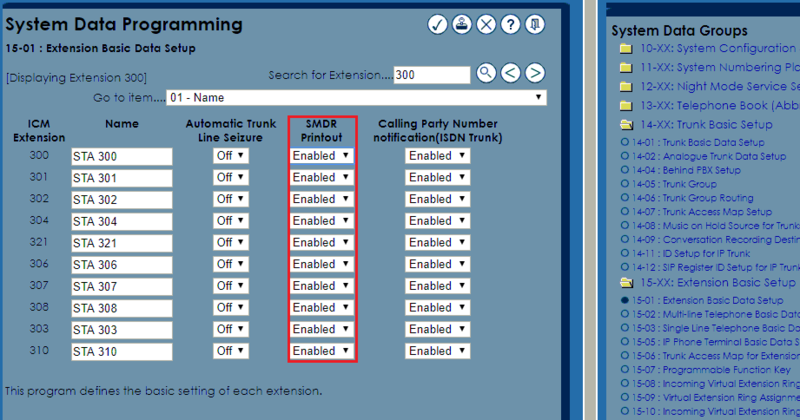 Enter 0 to have SMDR include only calls dialed using PBX trunk access code. Select whether the system should display the trunk name (0) or the number (1) on SMDR reports. If this option is set to "1", Program 35-02-14 must be set to "0". Enter 1 to enable a summary reportEnter 0 to disable a summary report. The daily report prints every day at midnight. The weekly report prints every Sunday night at midnight. The monthly report prints at midnight on the last day of the month. Enter 0 if you want the SMDR report to include incoming calls. Enter 1 if you want the SMDR report to exclude incoming calls. Enter 0 if you want the SMDR report to include the extension's name. Enter 1 if you want the SMDR report to include the extension's number. Enter 1 to report information when all lines in a group are busy and an extension user tries to access the group. Enter 0 if this information should not be included. Determine if the DID table name should be displayed for incoming DID calls (0=Not Displayed, 1=Displayed). Determine if the Caller ID should be displayed when the incoming DID number is transferred to an outgoing trunk (0=Not Displayed, 1=Displayed). Determine whether the date should be displayed on SMDR reports (0=not displayed, 1=displayed). This option must be set to "0" if the trunk name is set to be displayed in Program 35-02-03. Enter 0 to display the Caller ID numberCurrently, option "1" for the DID number is not available. With software 4.0E+, determine if the Caller ID number (0), DID number (1) or Caller ID name (2) should be displayed in the SMDR output. Determine how the SMDR should print incoming calls on ANI/DNIS or DID trunksIf set to (1), ANI/DNIS trunks can print DNIS digitsFor DID trunks, if the received number is not defined in Program 22-11-01, then no number will be printedIf set to (0) trunk names are printed instead (as assigned in Program 14-01-01). Determine whether the Account Code (0) or Caller ID name (1) should appear in the SMDR recordBy default, the Account Code will be displayed. Note: Program 35-01-08 must be set to "0" for this entry to be followed. This PBX outputs SMDR data via IP. Login using the installer name and password (Factory Default Settings for the NEC Aspire WebPro: ASPIRE/12345678). Reboot your PBX if you have changed something in "NTCPU Network Setup". Our software should work in the TCP client mode. It means that our software will initiate connection with the PBX and the PBX will work as a server. Add one or several PBX IP addresses here (the IP address of the NEC Aspire [Format2,Date]). The port number should match the port that you have defined within the PBX (60010 in the example below).